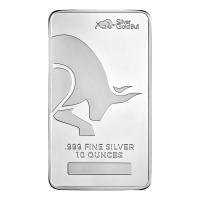 Frighteningly real: The ﬁrst 3 oz Antique Finish Silver coin with a tremendous great white shark motif! Through Extra High Relief Technique the beast emerges out of the marine-blue Enamel creating a stunning 3D-effect. 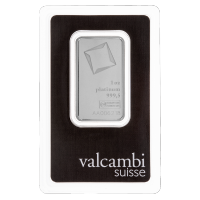 Each coin is individually numbered which guarantees the authenticity and strict limitation of worldwide only 999 pieces! 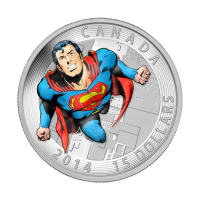 This is the ﬁrst coin of a brand new series from Barbados. 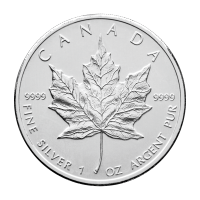 A collection privy mark proofs the authenticity of this coin - exlusive accessories and a Certificate of Authenticity are included. Obverse The Barbados coat of arm surrounded by various kinds of sea life. Reverse A seemingly hungry great white shark emerging from the water. The Barbados coat of arm surrounded by various kinds of sea life. A seemingly hungry great white shark emerging from the water. 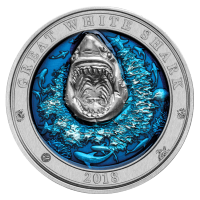 3 oz 2018 Barbados Underwater World | The Great White Shark Silver Coin Frighteningly real: The ﬁrst 3 oz Antique Finish Silver coin with a tremendous great white shark motif! Through Extra High Relief Technique the beast emerges out of the marine-blue Enamel creating a stunning 3D-effect. 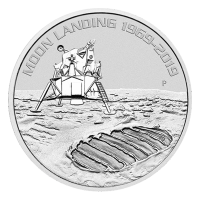 Each coin is individually numbered which guarantees the authenticity and strict limitation of worldwide only 999 pieces! This is the ﬁrst coin of a brand new series from Barbados. 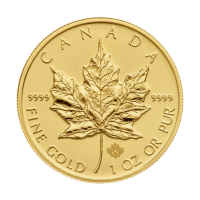 A collection privy mark proofs the authenticity of this coin - exlusive accessories and a Certificate of Authenticity are included.